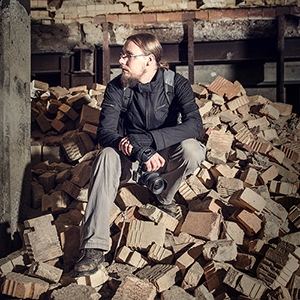 CM Goodenbury is a Rochester, NY based photographer specializing in photos of abandoned spaces, forgotten items, and urban decay. His photography is meant to evoke a sense of longing for ages past, feelings of quiet loneliness, and an appreciation and understanding of the world's beauty even when in decline or decay. Most of his photos are taken with a wide angle lens, immersing the viewer in scenes of collapsing gothic cathedrals, ruined relics of the rust belt and the empty, foreboding halls of forgotten asylums. For any inquiries about licensing or freelance work, email CMGoodenburyPhoto@gmail.com.